Eldon House is probably the most important historical home in London and was a centre of social and political events from its construction in 1834 until it became the property of the City in 1960. 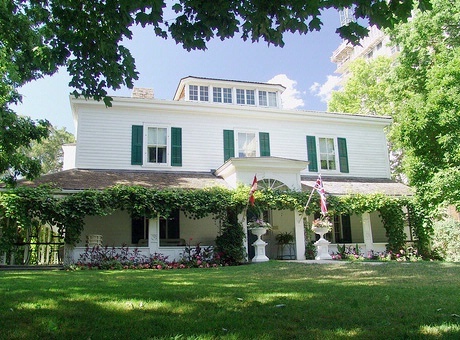 The first owner, John Harris, RN, was the Treasurer of the London District, that is the central part of the south-western peninsula of Ontario, and was a leading political figure in the local Family Compact. In 1837, he participated in the raid on the "Caroline" in the Niagara River and may have set fire to the ship. After his death, his wife, Amelia Ryerse of Port Ryerse, who came from the same prominent Ontario family as the Rev. Egerton Ryerson, continued to live in the house which was greatly expanded in 1877. Later, occupants of the house included George Becher Harris, a prominent London lawyer and his daughter, Amelia Archange Harris (1868-1959) who was the last member of the family to live at Eldon House. She was prominent in many sporting and charitable institutions in London. The house, with its original furnishings, provides an excellent example of the life of the gentry of the region for over a century. The variety of the contents brought back from almost all corners of the world, shows their wide interests and the broader connections and outlook of the region, which can be so easily forgotten. Eldon House is a fine frame house designed in the Regency style and subsequently enlarged and adapted to suit climatic conditions. Eldon House and its grounds linking with Harris Park form an excellent north-west closure in the area of the Forks of the Thames.